This entry was posted in Uncategorized on June 22, 2018 by eonewjersey. Meet new member Casey Bickhardt, General Machine Company of NJ. Click here to read about one of EONJ’s newest members! This entry was posted in Chapter News on June 22, 2018 by eonewjersey. Brain Health Initiatives Highlighted Through Alzheimer’s Association Grand Opening Events (Michael Schofel, Eastman Companies) Click here to read more. Eight O’Clock, Chili’s Deploy Augmented Reality Games (Denise Blasevick & Adam Schnitzler, The S3 Agency). Click here to read more. Brighton Cromwell to Exhibit at Eurosatory 2018 (Glenn VanEtten, Brighton Cromwell) Click here to read more. Announcing the First Burger Summit at the Ellis Island National Museum of Immigration (Lance Appelbaum, Fossel Farms) Click here to read more. Accounts in Transit (Denise Blasevick & Adam Schnitzler, The S3 Agency). Click here to read more. 50th Anniversary Jersey Awards names Giovatto Advertising Best of Show Click here to read more. Ken Gruskin, The Gruskin Group – won Best of Newspaper for “Lake George Jazz Weekend” (Lake George Arts Council). The Gruskin Group won 18 awards, including eight-first place and four-second place trophies. Denise Blasevick & Adam Schnitzler, The S3 Agency – won Best of Out of Home for “Adopt a City Pet Campaign” (Liberty Humane Society). The agency won 12 additional awards, including eight first-place and one second-place trophies. This entry was posted in Members in the News on June 22, 2018 by eonewjersey. Norris McLaughlin is a mid-sized, regional law firm that serves the legal needs of businesses and families in New Jersey, New York, and Pennsylvania. We are uniquely positioned to represent middle-market companies, Fortune 500 corporations, and individuals. Norris McLaughlin is attentive and responsive to the needs of established and emerging middle-market, privately-owned companies, providing quality and comprehensive legal services. We are dedicated to the success of our clients, whether in a transaction, in court, or in the course of everyday business. We bring niche industry experience to companies that may have outgrown their existing legal service provider or need more experience, resources, and in-depth knowledge of their particular market. We have earned a reputation for becoming our clients’ trusted advisors and virtual business partners due to our ability to create efficient legal and practical counsel, saving them time and money in helping to bring their businesses to the next level. Our clients gain a strategic and competitive advantage from the firm’s entrepreneurial spirit and client-centered, team approach. Northeast Wealth Planners – sponsored the After Party at Talde on May 17. The Bernards Inn – As an In Kind Sponsor The Bernards Inn is granting FREE space for EONJ meetings – FREE meeting rooms ($300 value) and FREE AV equipment ($300 value) – Just mention you are an EONJ Member when calling – Think about hosting your Forum or next family party at the Bernards Inn! This entry was posted in Chapter News on June 8, 2018 by eonewjersey. Global Charging Kiosk Market Outlook 2018-2023 : Brightbox, GIDOPHONE, ChargeItSpot, Veloxity, ChargeTech, goCharge, InCharged (Jessica Gonzalez, InCharged) Click here to read more. Why are you having trouble closing the sale? (Caryn Kopp, Kopp Consulting) Click here to read more. Summer STEM camps at Columbia-Greene CC starting July 9 (Rich Ginn, Black Rocket Productions, LLC) Click here to read more. This entry was posted in Uncategorized on June 8, 2018 by eonewjersey. 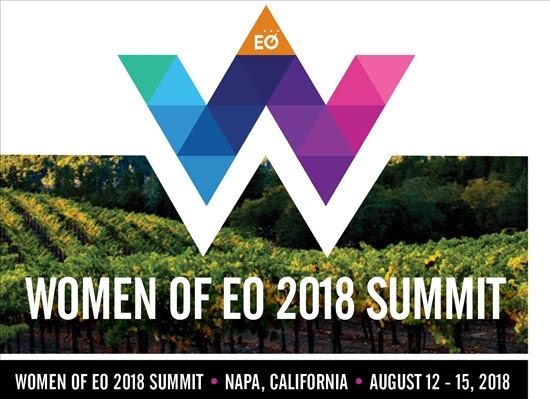 Join both men and women EO members in California to expand your EO experience! You’ll come together around the most meaningful areas of our lives: business, health, leadership, relationships, family and personal growth. This event takes place 12–15 August at the stunning Hotel Villago in Napa, California, USA. >> Learn more and register today! You can also contact event Champion Winnie Hart. The EO Global Exploration team has been working hard on another once-in-a-lifetime adventure! 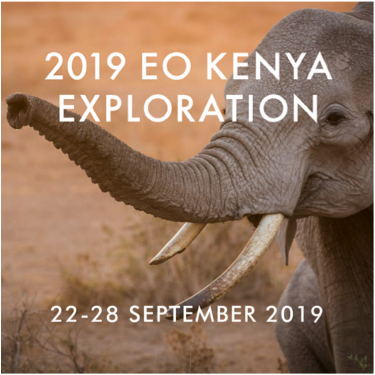 Registration for the 2019 EO Kenya Exploration, taking place 22–28 September 2019, will open on 12 June! From stunning views of Mount Kenya to encounters with African elephants at the famed Nairobi National Park, the 2019 EO Kenya Exploration is something you must experience in your lifetime. >>Learn more about the Exploration, sign up for the interest list and get ready to register on 12 June. Seats are limited, so move fast! Successful entrepreneurs know that they will face fierce competition in the market and need to be up-to-date with the latest innovations and ideas to keep their businesses thriving. 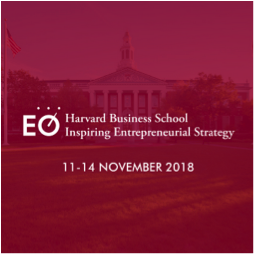 At EO with Harvard Business School Executive Education: Inspiring Entrepreneurial Strategy, members will develop groundbreaking strategies and skills in analyzing industry evolution to help their businesses grow. At this exclusive EO Executive Education program, attendees learn from Harvard faculty in live discussions and participate in case studies and study groups. Attend guest speaker events that deliver the competitive advantage you need to thrive in this complex global economy. >> Join 67 of your EO peers in this first-of-its-kind event from 11–14 November 2018! Registration opens 13 June—mark your calendars and sign up for the interest list for more information! EO Discover China Series is the flagship event of the Greater China Region. Join us in Taipan from 2–4 November 2018 for learning, networking and amazing experiences. Save the Date: 2019 EO Portugal University! 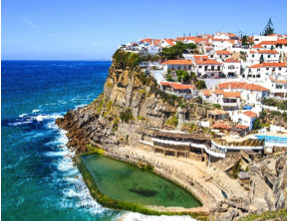 A picturesque Portuguese fishing town—and Lisbon’s most popular coastline destination—Cascais will serve as our backdrop for the 2019 EO Portugal University, taking place 29 May – 2 June 2019! >> Sign up for the interest list to receive more information. The registration date will be announced soon! 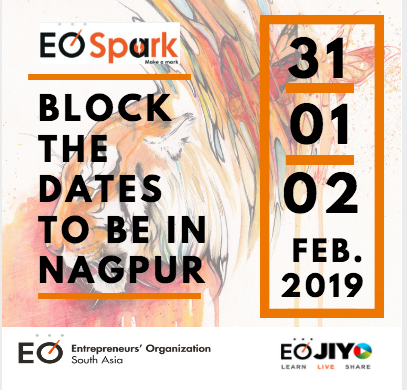 Block out your calendars for this EO South Asia Regional event being hosted by EO Nagpur, which is scheduled for 31 January – 2 February 2019. Stay tuned for more information! This entry was posted in Global News on June 8, 2018 by eonewjersey.